Elections 2012: Why Are Treaty Obligations ‘Discretionary’ Spending? By Mark TrahantNearly every politician, Democrat, Republican or independent, says that treaties made with American Indian tribes are solemn and sacred obligations. The National Congress of American Indians made this point when it released its 2013 budget request. “Effective self-rule requires that the U.S. respect tribes’ inherent right of self-government and that the federal government honor its trust obligations to Native peoples in the federal budget,” NCAI said. Most mainstream politicians agree. In theory. The Republican Party platform, for example, says United States’ “obligations have not been sufficiently honored. The social and economic problems that plague Indian country have grown worse over the last several decades; we must reverse that trend. Ineffective federal programs deprive American Indians of the services they need, and long-term failures threaten to undermine tribal sovereignty itself.” And similar statements are floating around from Democrats. The point is that nearly everyone supports treaty rights. But there’s one little glitch. No politician has pushed legislation, or budgeting authority, or any other concrete action to move those solemn treaty obligations into the automatic side of spending. The federal government spends pulling from two large buckets of money, appropriated funds and entitlement funds. The first means exactly what it says, Congress must debate and then appropriate the funding. Entitlement is automatic. The money for Social Security, Medicare, and such, is supposed to be there no matter what. Then treaty obligations, both those with American Indian tribes and those with international powers, have always been discretionary from a budgeting standpoint. It’s nearly impossible to reclassify spending that’s always been an appropriation, not a legal budgetary obligation. Rob: America committed genocide against Indians. White guy: Okay, but what do you expect me to do about it? What's past is past. Rob: You can honor the treaties now. The next question might be, "Okay, but what does 'honoring the treaties' actually involve?" Mark Trahant gives us a good answer here. Educate yourself about Native issues. Vote for candidates who understand and will fight for tribal sovereignty and treaty rights. Vote for candidates who will raise your taxes, if necessary, to pay for treaty obligations. 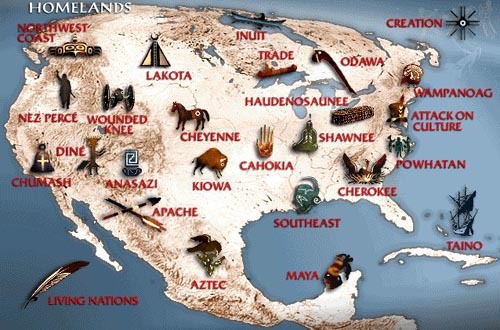 Remember, your predecessors (whether they were your ancestors or not) stole most of America from the Indians. You're probably living on land that they took by hook or crook. These predecessors pledged to pay the Indians in perpetuity for the value of the land. As a citizen who benefits from this land, therefore, you owe the Indians money. If you're sincere about honoring the treaties, you'll pay what you owe without crying about it. If you don't like it, you're welcome to leave the country. Or you can give the land back so you won't have to pay for it anymore. For more on Indian treaties, see Treaty Payments in The Mentalist and What If US Honored Treaties? The term "discretionary spending" is over-used and pretty much meaningless. Because all of the spending is discretionary. I often see the term used not as it is here, but to produce deceptive budget charts/diagrams that paint an untrue picture of the Federal budget by leaving off major spending that alters the proportions. well I agree with your conclusion.